Mount Zinit - Part 4 - Updates - WAKFU, The strategic MMORPG with a real environmental and political system. Take on a one-of-a-kind boss in an epic battle that will have ra real impact on the world. Take part in a community event with a global scoring system for each server. Upgrade your epic items and relics, or create new items (Souvenir items) with Ogrest's Tears, items that can be collected throughout the World of Twelve when Ogrest has been calmed by the players on the server. This new content is for players of level 200! See the devblog for more information. With the release of DOFUS Pets and its new range of animal companions, the existing pets in WAKFU weren't quite measuring up anymore. That's why we decided to apply a global rebalancing and upgrade of the pets in WAKFU, inspired by the ones in DOFUS Pets. See the news for more information. The Haven Bag decoration recipes have been simplified and made more consistent so that the same number are available for each level bracket, and so that they require similar amounts of ingredients. Many decorations can now also be dropped by monsters in the ecosystem (not by dungeon mobs or in Haven Worlds), or by dungeon bosses. A new interface for professions. Fusion of the three Weapons Master professions. New rewards in end-of-season chests. Redesign of the Riktus, Crackler, and Field Plants families. 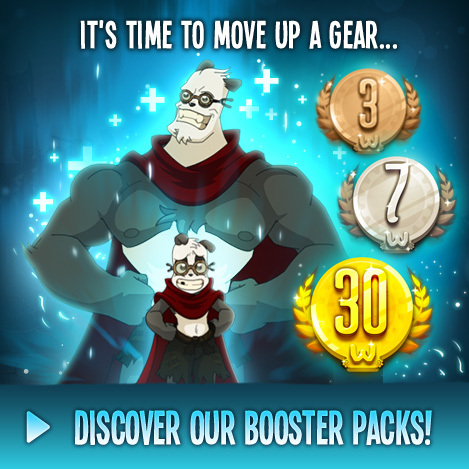 Note that access to Mount Zinit (parts 1, 2, 3, and 4) will only be available to Booster Pack holders. See you in-game on Tuesday, August 29th!